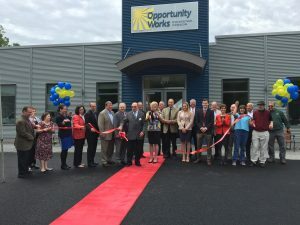 A host of state and local officials and other dignitaries cut the ribbon for the new Opportunity Works in Haverhill campus abutting Northern Essex Community College in Haverhill. 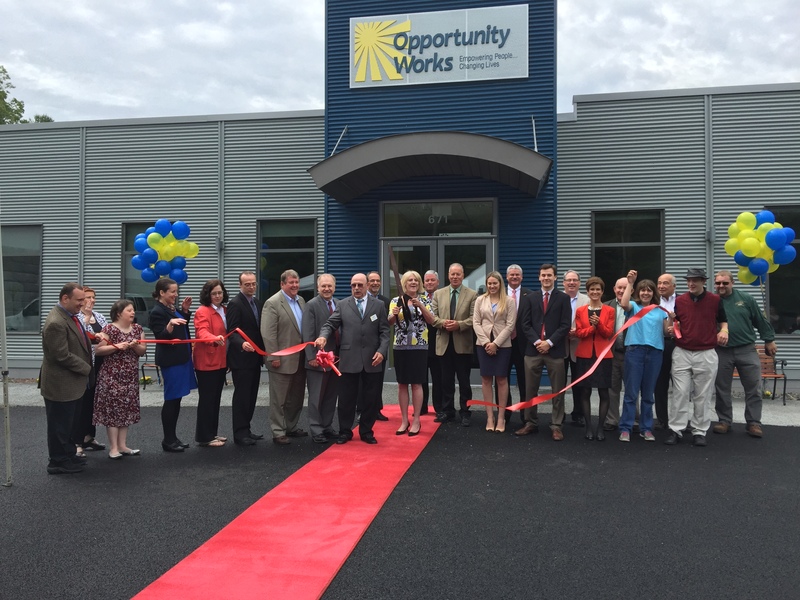 Opportunity Works, Inc., a private, not-for-profit organization that empowers adults with disabilities and their families opened their brand new facility in Haverhill on Friday, June 26. State and local officials and the Greater Haverhill Chamber of Commerce were on hand to cut the ribbon and celebrate one of New England’s newest facilities devoted to programming and services for adults with disabilities and their families. Opportunity Works Executive Director Jane Harris-Fale hosted the event with special guest speakers, including State Senator Kathleen O’Connor Ives; Ed Fitzgerald, Area Director of the Department of Developmental Services (DDS); William Heineman, Northern Essex Community College (NECC) Vice President of Academic and Student Affairs; Mike Zerigian, President of the Opportunity Works Board of Directors; Lucien Lacroix, Chairman of the Opportunity Works in Haverhill Building Committee; Justin Sanchez, Opportunity Works participant and Stacey Bruzzese, President of the Greater Haverhill Chamber of Commerce. Several Opportunity Works participants assisted in the morning ribbon cutting and evening celebration and, in addition to the guest speakers, were joined by State Representative James Kelcourse, Newburyport Mayor Donna Holaday, William Fallon, President of BWK Construction, William Soupcoff of TMS Architects, Scott Cote, President of Pentucket Bank, Tom Mortimer, President of Haverhill Bank, Mandy Chalmers, Regional Director of DDS, William Moynihan, Chairman of the NECC Board of Trustees, Jean Poth, NECC Vice President of Institutional Advancement, Project Manager Jason Lacroix, Attorney Timothy Schiavoni, representatives from the offices of State Representatives Brian S. Dempsey and Linda Dean Campbell and Haverhill City Councilors William Macek, Melinda Barrett and Thomas Sullivan. Opportunity Works Capital Campaign Director John Guerin served as master of ceremonies. The building, abutting Northern Essex Community College, includes twelve specialized classrooms that offer state of the art technology and a variety of integrated, multidisciplinary supports and services. The General Contractor was BWK Construction of Middleton, Massachusetts. The $6.7 million building was specially designed by TMS Architects of Portsmouth, New Hampshire. Due to the increased demand for services and the high quality of its programs, Opportunity Works has grown dramatically both in the numbers of people served and in the scope of the programs provided. Today, nearly 250 people from across the Merrimack Valley take part in a diverse selection of support programs offered by the agency. Opportunity Works previously maintained a satellite facility in Haverhill for over fifteen years. Opportunity Works is recognized to be one of the premier human service agencies in New England.